Without having Microsoft Project Server, here is a way to manage shared resources through various projects. By using this method, the program manager or unit manager can check team member allocation and plan projects. The next point is to create a first project plan. 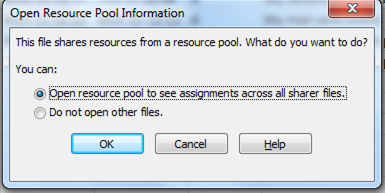 Note that the resource pool file should be opened before being able to use the shared resources. Now let’s open shared resource pool from this project. Choose your resource pool file and set up conflict option. 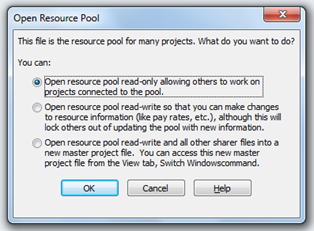 By default the Resource Pool takes precedence over the project file (sharer). On the project file it displays shared resources. You can now assign your resources to your tasks and see the updated project plan. · Task 2.2 cannot start on Friday as the resource assigned only works on Mondays. I would like now to plan another simple project with the same team. I create my project plan #2 and assign resources. And I see in this example a resource over allocation (“My developer full time” is assign to 2 tasks, one in each project). One of the solutions to deal with resource over allocation is to use the team planner. Note that the team planner is only available in Microsoft Project Professional 2010. By dragging and dropping the task to either another project team member that is available or move it when the current team member is available, you remove the over allocation. Question 1: what happen if I first open my resource pool? Question 2: what happen if I first open my project file (sharer) without opening the resource pool? Question 3: What if I change resource information from a sharer (project file)? Microsoft Project will pop you up to either save the resource pool with modifications and then update all sharers, or cancel this change. 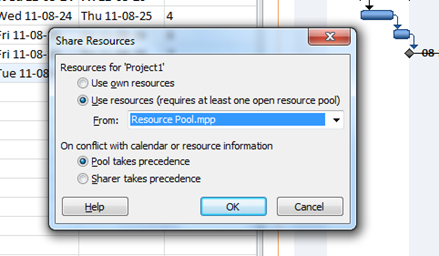 Question 4: Is it possible to add a resource to project1.mpp, which should not be on the resource pool? No, this is not possible. If you add a resource to projec1, the resource pool will be updated.